You can't beat their price! Great caps, great pricing and will order again. Interesting, fun designs and a good variety of colors as I ordered five of the grab bags caps, great price and quality. 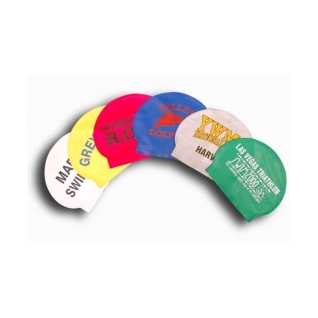 These grab bag caps are great for swim practices. Silicon caps give me a headache if I wear them for too long, so I always wear latex for practice. It's fun to have random caps from teams all around the country; it keeps me guessing as to which team I'll represent next! Best value anywhere. These caps are excellent. Im going to hand them out to friends. bargain! the styles are fine.